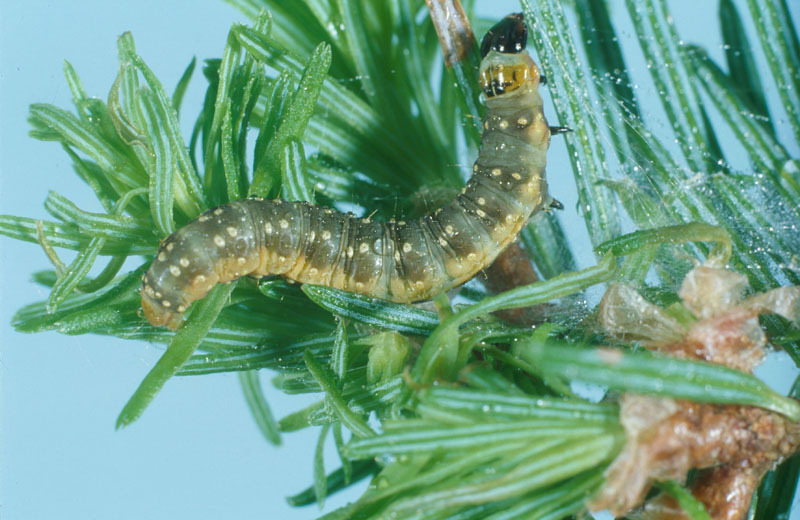 Spruce budworm damage appears in May. 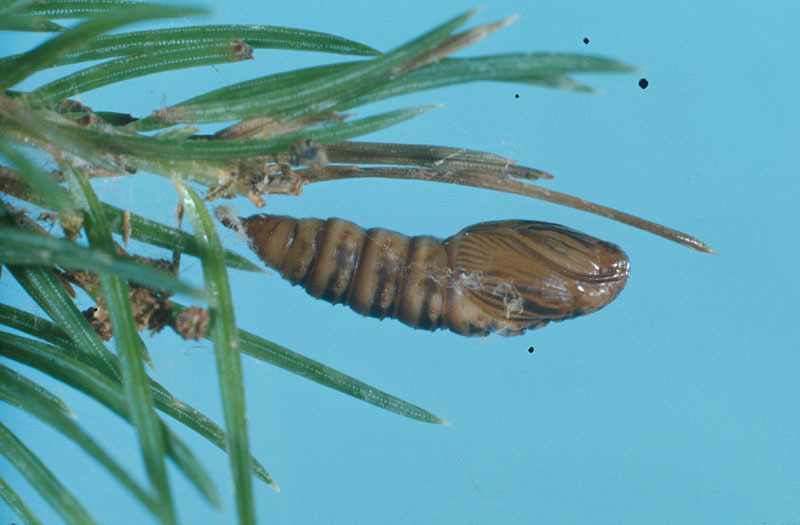 Evidence of a spruce budworm infestation includes the destruction of buds, abnormal spreading of new twigs, defoliation of current-year shoots and, if an affected branch is disturbed, the presence of large numbers of larvae suspended from strands of silk. Defoliation begins at the top of the tree and quickly progresses to the periphery of the crown from the top downwards. 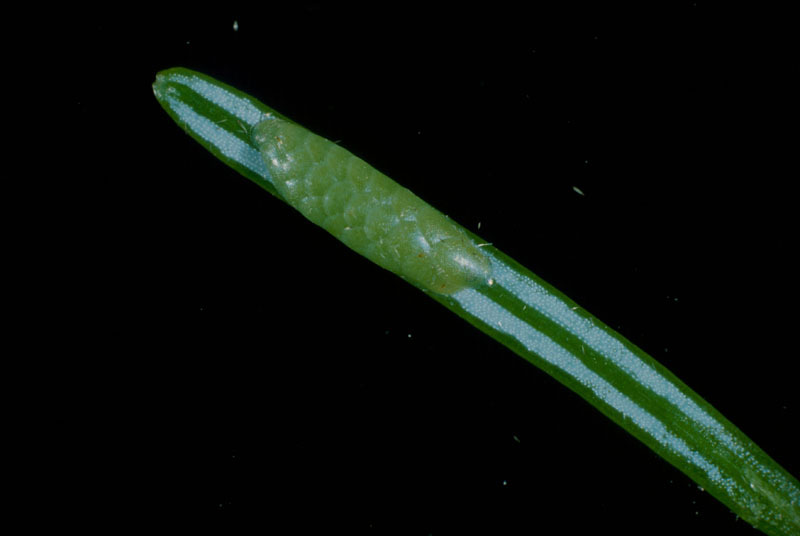 Current-year needles are partially or completely consumed and, if large numbers of larvae are present, previous-year needles may also be affected. 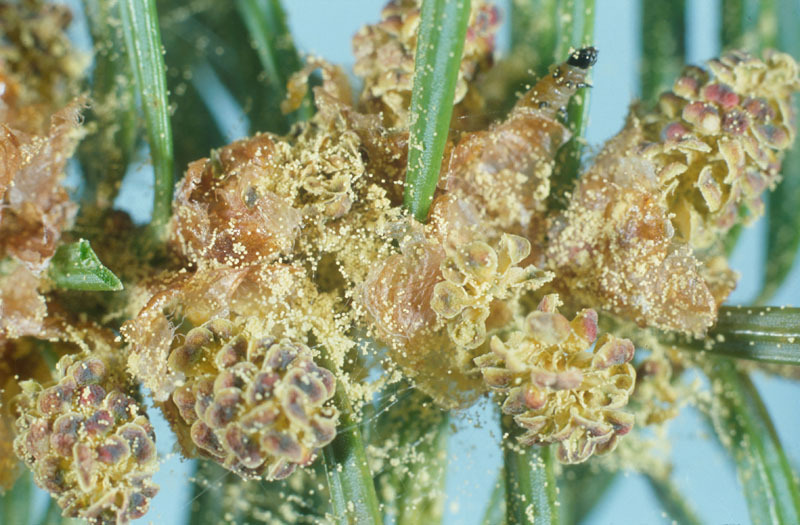 Spruce budworm larvae also feed on staminate (male) flowers and cones. During epidemics, the larvae may destroy all of the cones. Severely affected stands turn a rust colour due to the presence of dried out needles held by strands of silk spun by the larvae. In the fall, most dead needles are dispersed by the wind and defoliated stands take on a greyish appearance. A single year of defoliation generally has little impact on the tree. However, it does cause weakening of the tree, making it more susceptible to attacks by other insects. Defoliation over a few consecutive years causes tree growth loss. 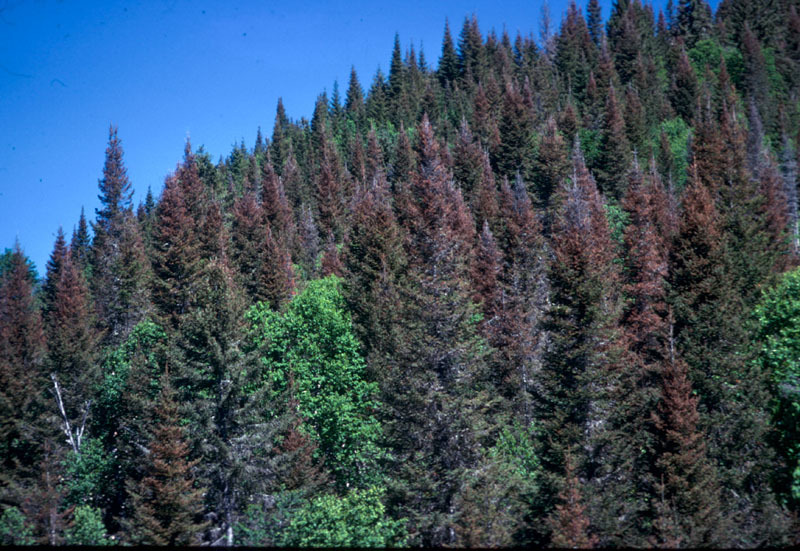 However, if defoliation of current- and previous-year shoots continues uninterrupted over several years, some trees will die, while others will continue to gradually decline for several years, even after the end of the infestation. 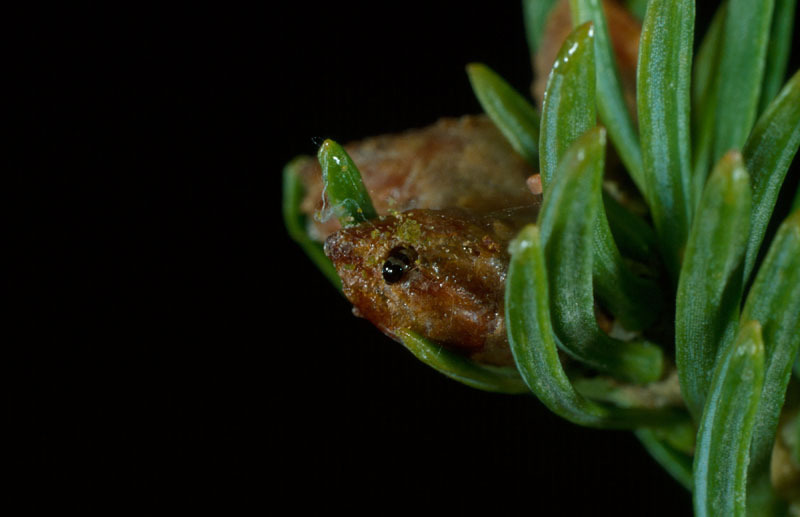 This is the case with fir, the species most vulnerable to spruce budworm attacks, which dies after four consecutive years of severe defoliation. In July and August, the female deposits her eggs in clusters of 10 to 30 under the needles of shoots, preferring those exposed to sunlight. The newly hatched larvae move towards the interior of the crown in search of a suitable overwintering site and construct a silken shelter, called a hibernaculum. 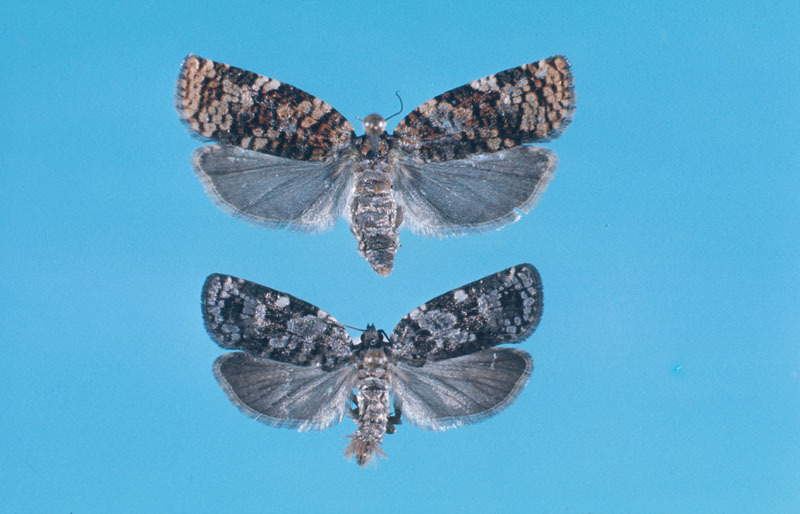 A native species, the spruce budworm is considered the most serious pest of fir and spruce forests in North America. 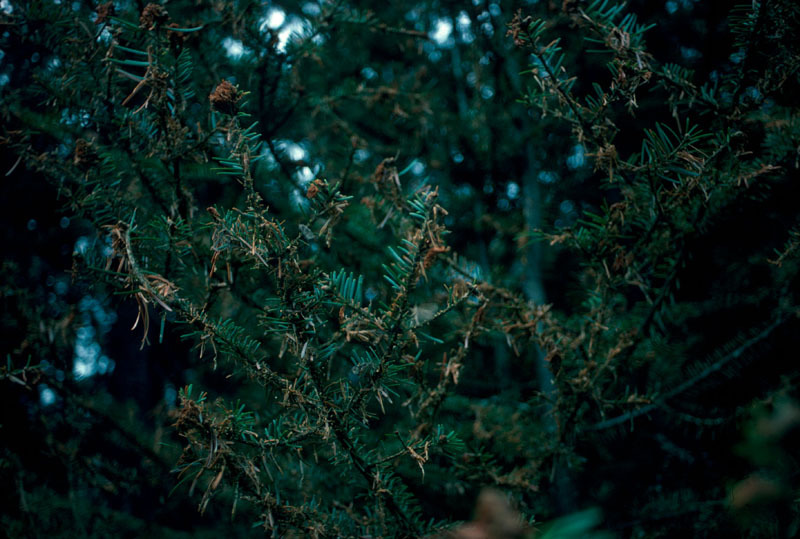 Its range coincides with that of fir, white spruce, and more and more with the range of the black spruce. Radial growth analyses of trees have shown that cyclical invasions likely occurred between the 18th and 20th centuries. 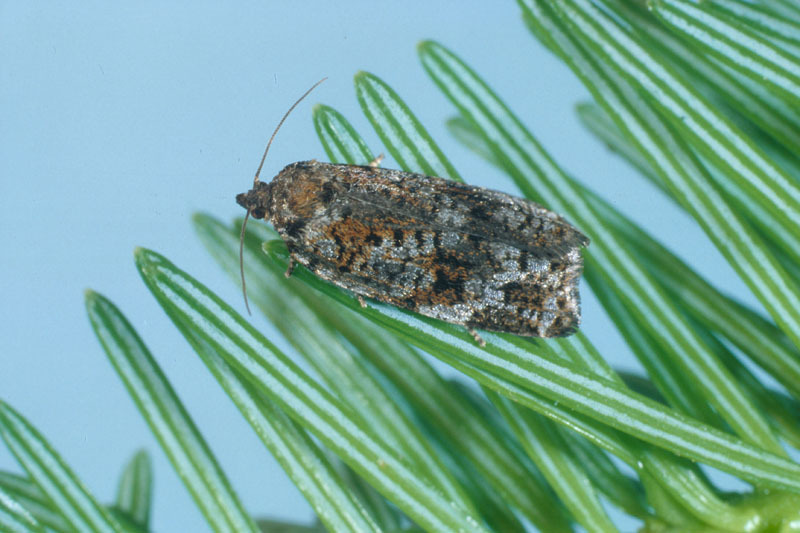 Spruce budworm populations are believed to have fluctuated during this period at intervals of 30 to 40 years. Since the beginning of the 20th century, three invasions have occurred in eastern North America. 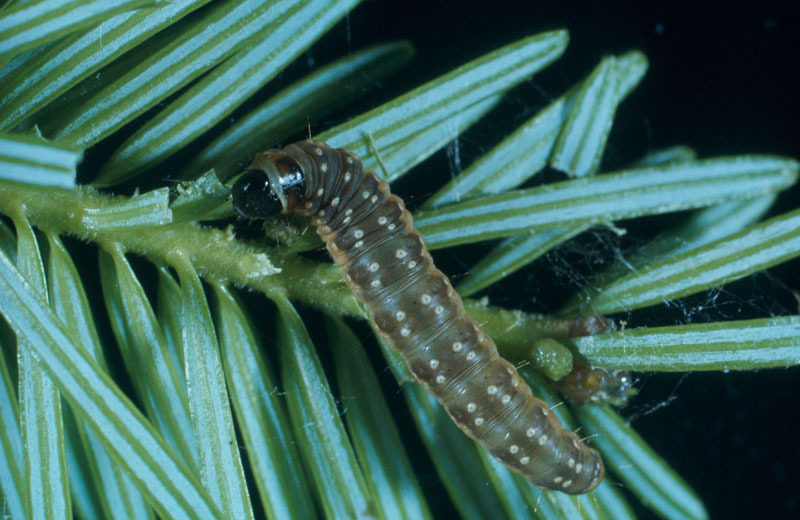 The spruce budworm is generally found in large fir stands. Much research has been conducted on this insect by the Canadian Forest Service and it is being monitored by the provincial forest departments. Most control methods mentioned in the recent literature involve the use of biological insecticides, primarily Bacillus thuringiensis var. kurstaki (B.t.k.). 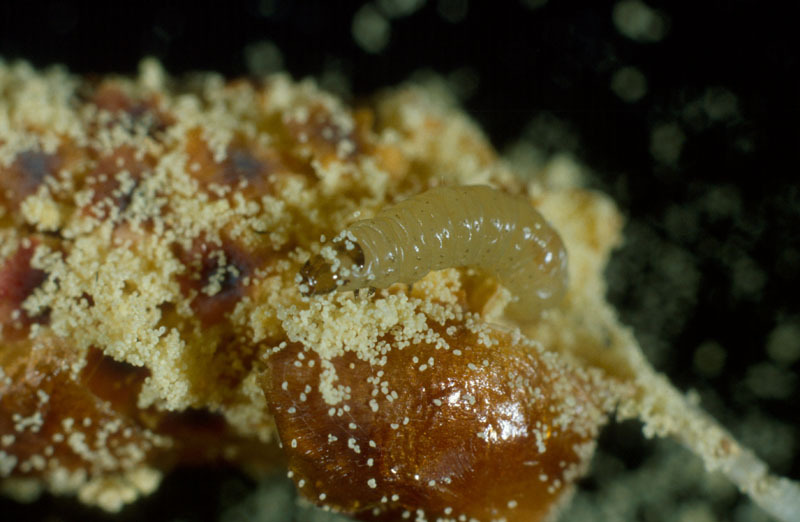 Through a combination of annual surveys, prediction models, targeted control strategies and proper forestry practices, it is now possible to reduce economic losses caused by spruce budworm outbreaks. 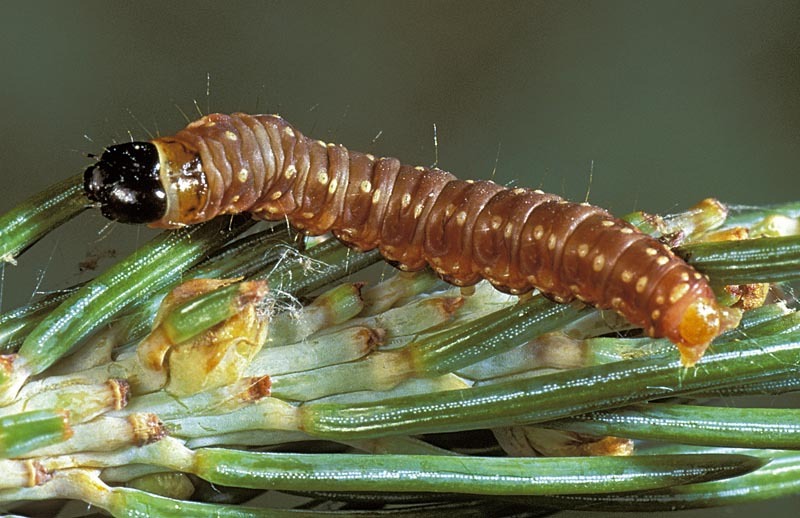 On isolated or ornamental trees, vigorously shaking the tree or spraying with a powerful water jet will cause the larvae to drop to the ground. 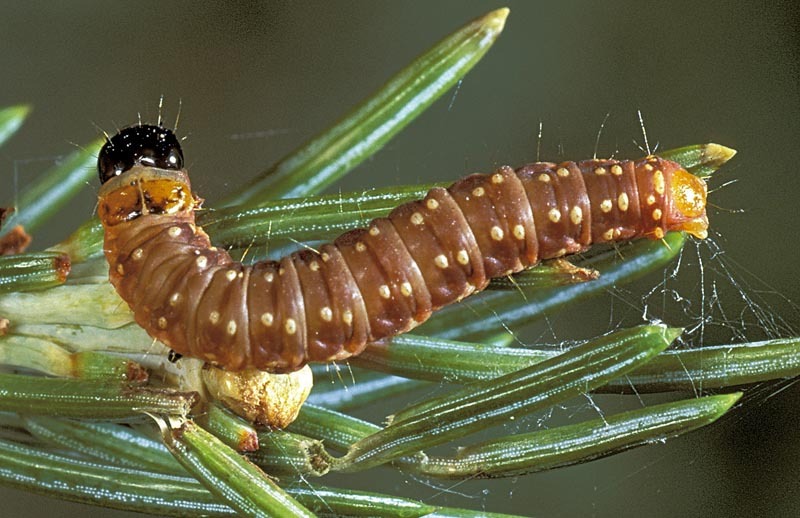 On small trees, the larvae can be removed by hand. Heteroconophagous : Feeds occasionally on seeds and cones, but usually lives and feeds on stems and needles. Pollinivorous : Feeds on pollen. Specimens are available for purchase from the CFS Insect Production Services.